Summer is almost over, and many of us in Wisconsin are starting to feel that gloom upon us. In all honesty my wife love summer, but love fall even more. We welcome fall with open arms but again sad to see summer weather retire. There are things I will miss during the summer months, in particular food, and one of those things is baked beans. Yes, I know… I can make baked beans all year round, and I do but for whatever reason baked beans just remind me of grilling outdoors, sitting around a smoker or eating smoked meat that has been cooked for 12 or more hours, or hanging out with family and friends. They almost are up there with sweet corn on the cob and garden tomatoes for me. The problem with baked beans in my family is that not really one of my kids, or my wife enjoy baked beans as much as I do. 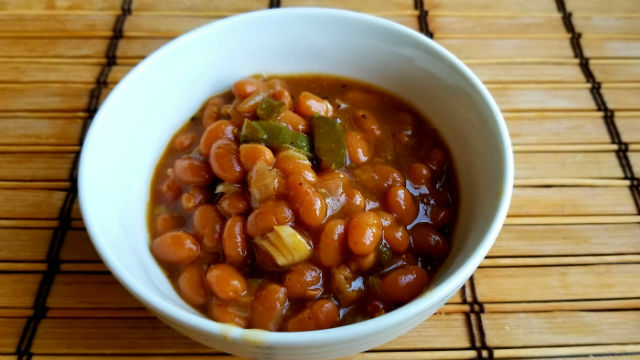 So with a recent get together, I decided it was my time to make some easy loaded baked beans that not only I could enjoy but I knew that other party goers would enjoy as well. I was right about that as the majority of those beans were consumed during the party. These look like normal baked beans, but every spoonful results in simple, yet complex flavors that may have you question ‘What are in these things?’. Easy, and loaded, these are great to make before (or after) summer ends. Let’s start by heating a large skillet on medium heat. Add in your bacon slices and your whole jalapeno pepper. Cook slowly to release the fat and to crisp up your bacon while at the same time cooking and charring your jalapeno pepper. You will want to blister the skin on the chili pepper throughout the time you cook your bacon. During this time, prepare your remaining ingredients as the rest will go by rather quickly. Once the bacon is cooked, remove and place on a paper lined plate, along with the jalapeno. Keep the skillet on medium heat, and add in the onion, cooking for about 5 minutes or so until they soften. While the onion is cooking, chop up your bacon, and your jalapeno. 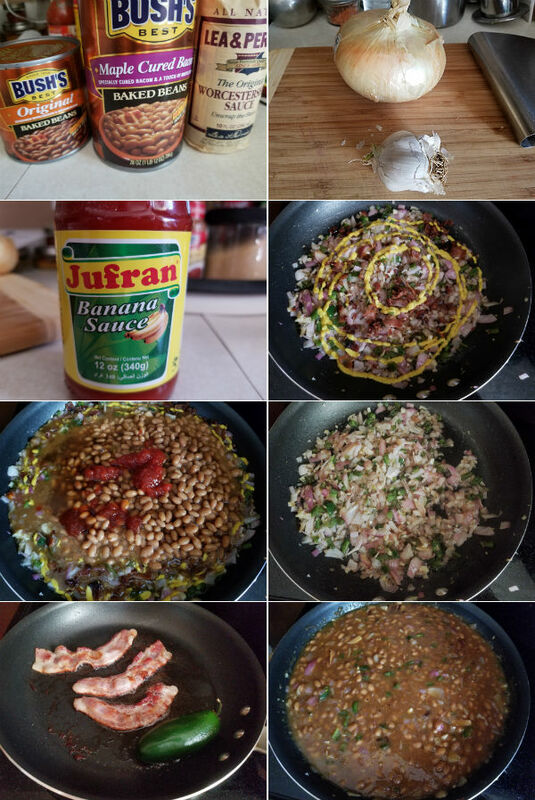 Once the onion is softened, add in the cans of beans, jalapeno, and bacon, and give that a good stir. Cook this mixture for about 5 minutes, then squirt on the mustard, worchestershire sauce, and Filipino ketchup. If you have never had or tried Filipino ketchup, go find it. I love this stuff. To me it is not as sweet as regular ketchup and actually provides some little kick to it. Give another good stir, reduce the heat, and cook for about 30 minutes until everything jives, and gets a bit sticky. Taste and season with any salt or black pepper to your liking. Serve into a bowl, and provide to your family and friends. The result is a great bowl of beans, and one that has some mysterious flavors. Sure you can get that flavor of bacon, and see the onions and jalapenos, but they might have your friends and family guessing on those wonderful mustard and ketchup flavors. Enjoy the rest of your summer, and hope you enjoy the beans!